1. In the horizontal bone loss, inflammation is distributed in the tissues in the following order: (1) in the connective tissue of the gums along connective tissue membranes surrounding blood vessels (2) in the alveolar bone, and (3) and, finally, into the periodontal ligament space (Fig. 3-14a). 2. The inflammation usually distributed in a way, because it's the path of least resistance. Periodontal ligament and fiber bundles to act as an effective barrier to the spread of inflammation. Thus, the inflammation spreads to the bone of the alveolar process, and then into the periodontal ligament space. 1. 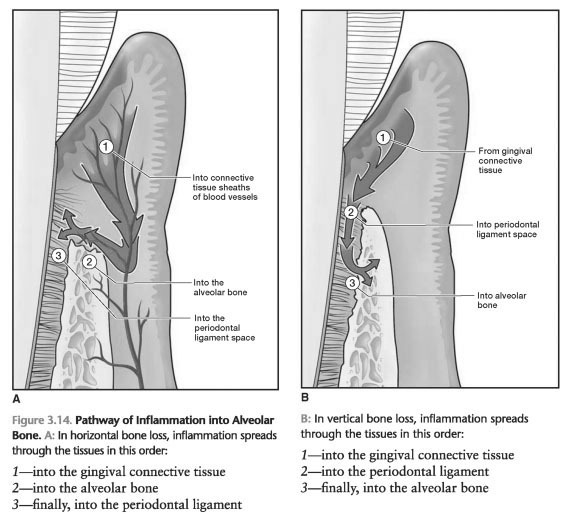 In the vertical bone loss, inflammation is distributed in the tissues in the following order: (1) in the connective tissue of the gums, (2) directly into the periodontal ligament space, and (3) and, finally, in the alveolar ridge (Fig. 3-14B). 2. The inflammation extends thus, whenever axial periodontal ligament and fiber bundles weakened and is not present more effective barrier. Before the events, such as occlusal trauma may be responsible for the weakened condition of fiber bundles.